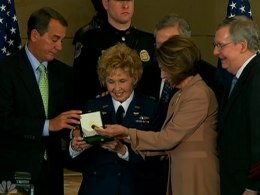 More than a half century after the end of WWII, 175 Women Air Force Service Pilots--better known as the WASPS--gathered at the Capitol to be awarded the Congressional Gold Medal. NBC's Brian Williams reports. >>> more than half a century after the end of world war ii , an extraordinary group of americans got some long overdue recognition today. the women air force service pilots, better known back in the day as wasps, some 175 of them now in their 80s and 90s, gathered at the u.s. capitol to be awarded the congressional gold medal . they flew noncombat missions during the war as pilots. they were denied veteran status for years. they accepted today's honor with characteristic humility. >> all we ever asked for is that our overlooked history would some day no longer be a missing chapter in the history of world war ii , in the history of the air force , in the history of aviation , and most especially, the history of america . >> theirs is an incredible story really. former pilot deannie parrish you saw there at the capitol today. all the estimated 300 wasp aviators still living 55 years now after world war ii .